Manufactured by Harmar, this stair lift is designed for optimal comfort, convenience and aesthetics. The space-saving Pinnacle folds to 11 inches; making it the narrowest lift on the market. The patented helical worm gear drive generates the smoothest and most energy-efficient ride available. 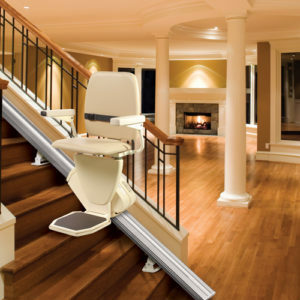 Narrowest stair lift in the industry – only 11″ wide when footrest and seat are folded!